I really thought all the hoopla about Chia Seeds was maybe just another "health food fad" ... but then I kept reading about the energy that people were getting from this miracle seed! And since that was something I so desperately needed to increase in my life, I decided to give this tiny little seed a chance in my diet! Oh boy, am I glad I did! Yes, Chia Seeds increase your energy, and I'm living proof! But don't ask me, let's look at the long-time use of this miracle seed in other cultures to see how it works! Chia seeds grow natively in South America, since as early as 3500 B.C. They were eaten by the Aztecs and Mayans and used as energy-sources for them, as well as a property of some medicines! Modern day chia seeds are now grown in other parts of the world, including US and Australia! Only 2 Tablespoons of chia seeds produces 11 grams of fiber, 4 grams of protein and 9 grams of healthy fat! 2 Tbsp of these seeds also delivers 18% of your body's daily need for calcium! Have I convinced you of the powerhouse these little seeds are? I wanted to use chia seeds simply - but found that putting them in my smoothie BEFORE blending just created a texture to the whole smoothie that I was not loving! (I'm texture sensitive, so that's a big deal to me! Anyone know what I mean?) So now, sometimes I add into the smoothie AFTER I've blended it up! I've seen plenty of recipes for Chia Pudding, but again, because of my "texture sensitivities" I found that I didn't really enjoy it made that thick. So I've created one I absolutely love and look forward to "drinking" as a powerful addition to my energy-meals daily! Here's how to make it FRESH Start style! Using a small mason jar, shake all ingredients together for a minute or two. Then place in fridge and enjoy within a few minutes or hours later. 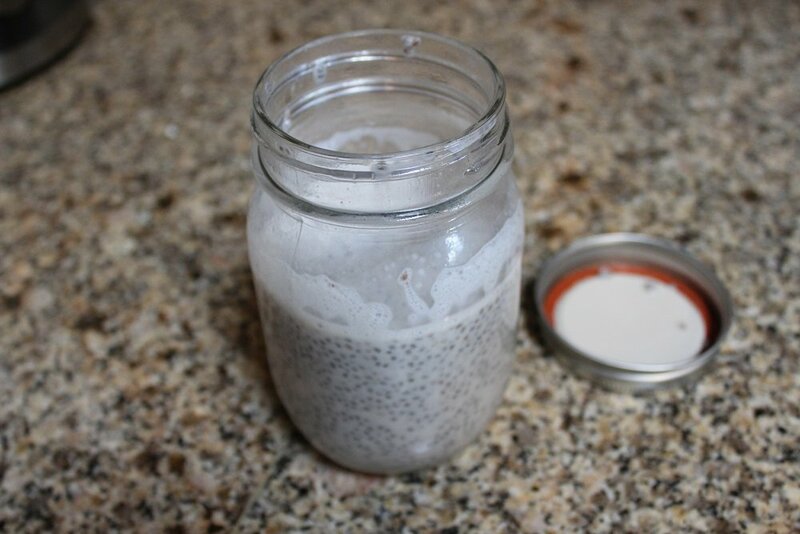 The chia seeds will swell up, absorbing the liquid and become easily ingested either by using a spoon or drinking straight from the jar. I dare you to replace one of your current choices for energy drink in the morning or afternoon with this delicious chiata from ingredients you can find anywhere! You'll never miss the ups and downs of the other drink, but will truly enjoy the steady, ongoing energy you get from this drink! Did you like this recipe? Get plenty more right here! Then let us know how YOU make YOUR Chiata in the comments below!